Now with 0.22 however comes the long awaited career mode and so there is a lot more method to the spaceship building madness. In this game mode you can no longer just throw something together some parts and see what happens as you did in the sandbox mode. Flights now have to be planned out, and the ships you build are limited by which parts your R&D guys have unlocked for you. R&D works off of the in came currency of science. Get your Kerbals to do a flight report and you get science points. Do the report at a higher altitude and get more science. Expose some weird goo to the harsh environments of space and get even more science. Be warned however, the things you do for your science points have diminishing returns, you can’t just milk the same soil sample forever. Once you have your science points you can spend them in the R&D centre for various new parts for your ship. If you’ve spent time in the game before this update you’ll recognise all the parts you can unlock from the sandbox mode. 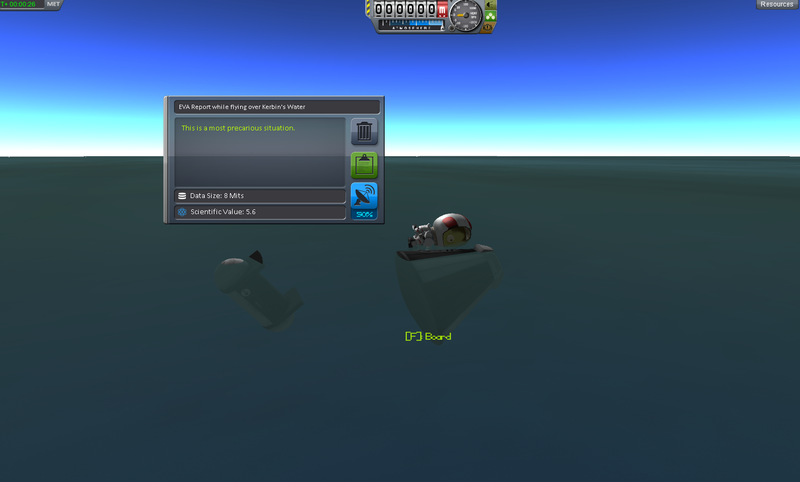 Having a limited supply of parts means you can no longer just stick a mainsail engine on the bottom of 5 Jumbo-64 fuel tanks and see what happens. You also can’t just leave your Kerbals wherever they end up. In my sandbox mode the sky was littered with ships I’d got into orbit with too little fuel left to get them back, waiting in the cold dark of space for a rescue mission that would probably never come. In career mode you need to get your guys back safely to get all the science they accrued on their trip. Never have I cared so much about parachutes. Whilst it was insanely fun to just mess around in the sandbox mode it could at times feel too unstructured. Once I got to a certain stage with my rocket design most launches and missions became routine, and any goals are just player created (so I don’t feel bad when I just give up on something). For me the career mode limitations have enhanced the game. There is now a greater element of challenge and the simple things like getting into orbit feel like more of an achievement. Don’t get me wrong, I still love sandbox mode, but I may take a back-seat to my Kerbal career. I do think its works to the advantage of career mode that most players will have spent a lot of time in the sandbox mode first. I think the first few career trips I made would have been a lot harder if I didn’t have a good practical idea of the limits of each of my parts. 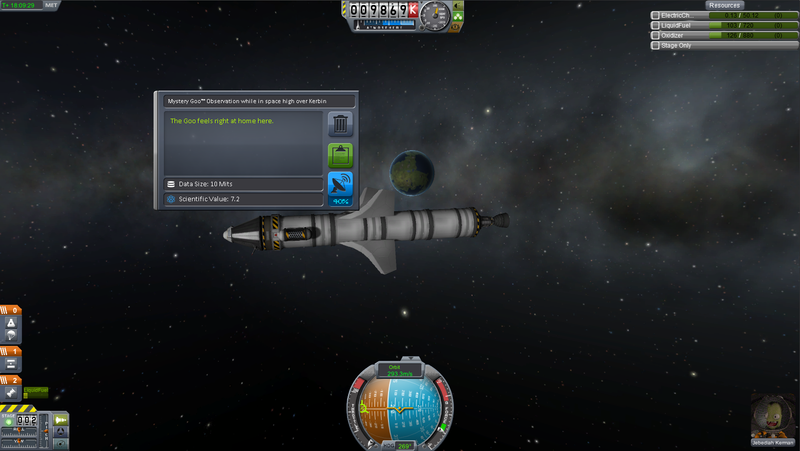 The career mode can get slightly grindy at times but it seems that pushing your Kerbals always gives you a way out. At the moment I need 20 more science points for my next R&D upgrade, but I seem to have exhausted most of the goo and orbital based research. On my latest trip I managed to get my current rocket out to the same radius as Mun but with not much fuel left. In order to get the science points I need I have two choices. 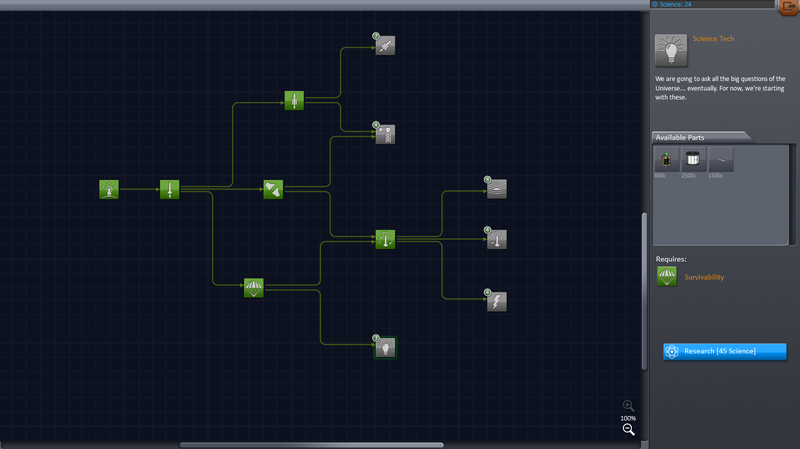 I could either grind and do lots of little goo experiments or I could try a risky flyby or orbit of the Mun. These will require changes to my rocket design that I’m not yet sure are possible with the parts I currently have. That’s what makes it so fun. I haven’t played the game for a while (after they updated the demo my PC took a real hit in performance) but what is available in the purchased version is very impressive (planets, space stations/planes etc) but this career mode will really appeal to a lot more people. I think the creativity in the game will definitely go up as well, with specific objectives there must be so many different ways of achieving them. I think I might have to give in and purchase the (full) game, providing my PC doesn’t melt in the process…. If you can get it running it’s definitely worth paying for the full version.